Since 1836 Washington County, Iowa officials have commissioned land surveys, maps, and many other public documents. Entire rooms of the Washington County Iowa Engineer�s offices are used to store and retrieve these important, one-of-a-kind documents. Every year countless more plans, drawings, and records are added to the archives to describe the county infrastructure of roads, buildings, culverts, signs, survey monuments, driveways, land corners, and bridges. The opportunity cost of not having this type of information readily available to a wide user group is growing. An integrated, fully developed knowledge management solution has become more a necessity than a luxury. Until recently this warehouse of information was accessible only by trained personnel in the County Engineer�s office. If requested, retrieval of one of these documents might take one to dozens of hours to locate; or maybe never, if previously misfiled. Once retrieved, the document may require special handling to avoid damaging the aged paper or fabric. The deteriorating courthouse plans of 1885 are there. Right-of-way plats and legal descriptions from the 1920�s reside in the archives. Land corner records and drawings for the earliest stone corners constructed in 1848 can be found here. Filed in a box somewhere is D. E. Brumback�s easement from 1928. All of the County�s bridges and its biennial bridge inspection records for its approximate 250 bridges are here. Strip maps up to 12 feet in length are kept rolled up in boxes in a closet. All of this information shares a common characteristic: it relates to features that exist spatially within Washington County, Iowa. In 2005, Geographical Information System (GIS) and document management technology was deployed to exploit these characteristics and to build an enterprise asset management GIS system. The majority of the asset documents were digitized and published to a web-based GIS so the entire collection could be �instantly retrieved using a mouse�. The document warehouse is now available to the world on the Web. The practical and financial benefits of this change are just now being realized. As the data is updated over time and users continue to use the system, it should have a significant return on investment (ROI). and links to the GIS (�Maps�) and other relevant sites. Limit public web access to some records and from public terminals positioned in the County office. Priorities for each asset were established based on potential costs and returns if added to the Asset Management GIS. The County�s Microsoft Access and Excel databases developed over the years were reviewed for inclusion in the new information system. These tables turned out to be quite advantageous to the County because they were easily included in the new asset management GIS resulting in considerable cost savings. A key component of the project that helped keep costs down was ASI�s expertise identifying the minimum fields of information on each form, index card, and map required to facilitate rapid retrieval of it and all related assets. ASI understood that as long as high resolution scans of the entire document were instantly retrievable, any ancillary information needed by the user could be read directly from the high resolution scanned documents. Avoiding unnecessary data entry resulted in substantial cost savings. Finally, a design document was written that defined the desired inputs, outputs and user-interface requirements of the system required to make it easy to use and that would preserve data integrity. that land corner and any scanned documentation about that corner inclucing the land corner certificate. After defining the project scope and goals, the project team began to sample the different historical asset types. Assistant County Engineer, Lyle Moen, had worked in the office for 36 years and was the resident expert on all the assets and asset documentation. He proved to be a key contributor to the project�s success because he could readily identify those documents and databases that had the importance and required integrity to be included in the project. Mr. Moen understood the nature of each type of asset and its related documentation, and many of the problems that could arise when trying to describe each document like inconsistent or erroneous data recorded on the documents, the use of different forms for an asset over time, and inconsistent attributes of the asset documents. For example, bridges are now assigned a 6-digit Federal FHWA number; however, in the 1930�s this number did not exist. These types of issues and the rules to appropriately handle them were important to develop before entering data in the system. ASI then began to inventory, collect, and sort the target asset documentation: letter-sized forms, 24� x36� maps and design drawings, strip maps up to 12� long, 3� x 5� index cards, and photographs of varying sizes. All needed to be counted and sorted so ASI personnel could quickly scan and describe each piece. The County considered doing much of the scanning and data entry themselves to reduce costs, but realized it would take years to complete. The GIS would not be used until all the data was resident and the search results were dependable. ASI completed the project in months and facilitated a much more rapid project completion. resolution scanned documents are available as links at the bottom of the screen. To achieve the goal of providing quick access to all the asset information either spatially using a map or by reading key fields, the home page provided links to each asset type and a single link (�MAPS�) to the geospatial portal. If a specific asset type link is clicked a list of all those assets is displayed showing a group of key fields that describe each asset (Figure 2). The specific key fields displayed on this screen were determined by our staff. 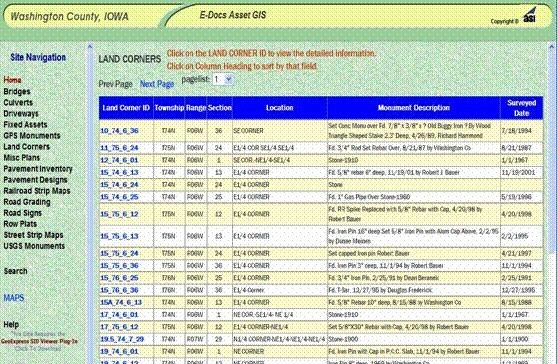 Each asset type has a single index key, e.g., Land Corner ID, which can be clicked to display the detailed information about a specific asset (Figure 3). High resolution scans were compressed in one of several common formats (e.g., MrSid, jpeg2000, PDF) to ensure maximum readability and minimize data storage requirements. Accessing the identical information from an interactive map (GIS) is possible by clicking on the MAPS link (Figure 3). This takes the user to a map server (e.g., ESRI ArcIMS) that contains any number of base map layers like orthophotography and road centerlines that add content and useful information to each asset type layer (Figure 4). and road centerline base maps layers. The display of all asset and base map layers is controlled using the right panel. Several standard tools are available on the left panel to zoom, pan, query, and measure. In addition, special search and hot link tools are available so the user can click on any asset and get detailed information about that asset. For example, when Hot Link is selected and the user clicks anywhere within a section, the user is presented with a list of all ROW plats that border the section (Figure 5). Other useful tools include Search TRS that allows the user to type in a specific township, range, and section, and then automatically zoom to it. The Query tool allows a user to search the attributes for any asset type for a specific value. Figure 5. List of adjoining ROW Plats displayed after clicking inside a section. ROW Plat and the scanned property plat. Data Updates. Another key design requirement was to enable County personnel to update the database as new information is acquired. New documents, GPS data, and attributes about assets located in the field are collected constantly. If this new information is not added to the Asset Management GIS it will become outdated and less useful. Therefore, a simple Arcobjects tool was designed. The tool allows County personnel to either import large numbers of records from existing databases or import records one at a time. 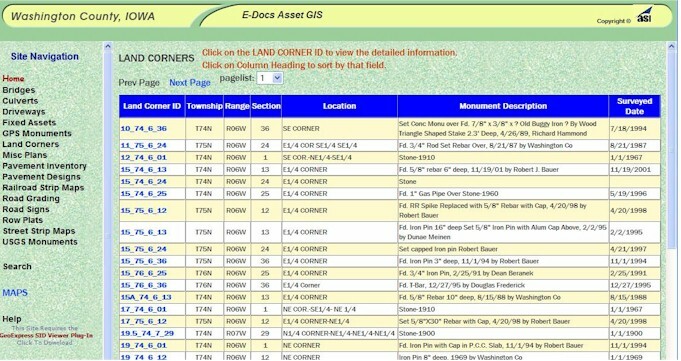 Once new asset records are imported, their spatial location is digitized on the county map and linked to that record. Search. Instant retrieval of detailed asset information is possible using the Search tool included on the website. This provides the fastest, most direct access to the asset information. It is extremely flexible and intuitive. 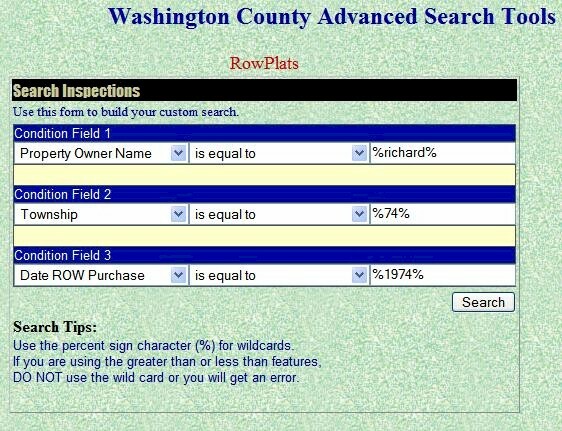 Advanced searches for specific values in any field of any asset can be executed using combo boxes and natural English (Figure 6). Figure 6. Advanced search tool showing a complex query made using simple English. Security. There were significant security concerns related to releasing all this information to the public website. 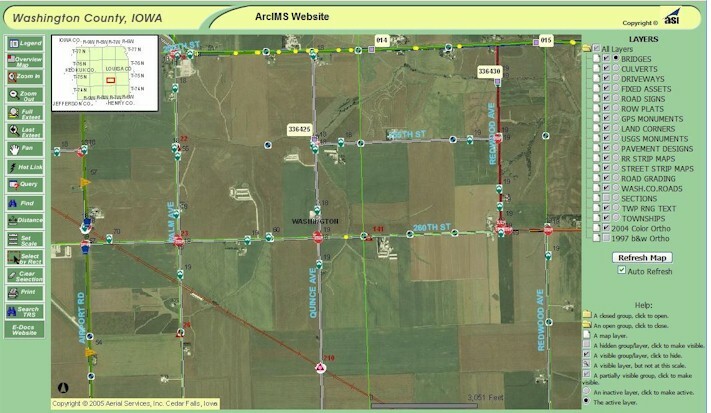 To facilitate granular security, the Asset E-Docs GIS can be configured so any subset of information can be published on the public website while the entire information store is available internally at the County Engineer�s office. The management team identified the scope of the project. However, this process did require more time than anticipated because of the age and variability of the historical documentation. It was a bonus that a �data expert�, someone intimately familiar with the information, participated in the project. Not only did Mr. Moen understand how one type of information logically related to another, but he had a good understanding of the type of data problems or inconsistencies that could occur because the information was acquired over many decades and could be erroneous, missing, or inconsistent. For example, standard forms used to record information today are different from those used in the 1970�s. The team benefited from involving the managers, technicians, users, and designers early in this process so the system delivers the optimum information with the available resources and makes the greatest ROI. Issues about which data to include, which fields to index, defining rules required to handle exceptional data, user interface design, and performance specifications, required thorough discussion and review by the project group. Mr. Patterson observed that �different personnel were required to carry the vision and implement the details of the project�. An important part of this success was the development of the rules to ensure that document data was consistently described, indexed to the other related documents, and subsequently retrieved despite the original document condition. Up-to-date, globally accessible information for land planners, engineers, surveyors and the public provides E-docs Asset Management GIS will grow with each passing website hit. 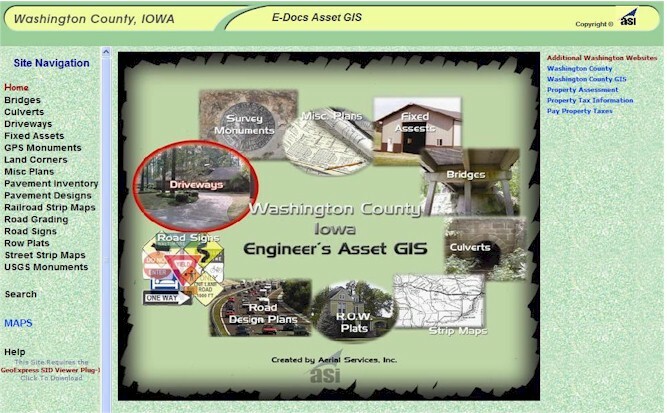 The Washington County E-Docs Asset GIS can be assessed at http://www.AerialServicesInc.com/washingtoncounty . Washington County was originally organized and established in 1839 as Slaughter County; however, residents soon changed the name to Washington County in honor of George Washington. Washington County is located in Southeast Iowa and covers 556.75 square miles in the richest of America's agricultural region. The population of the county was 19,612 people according to the 1990 census. The nine incorporated cities in the county are Ainsworth, Brighton, Coppock, Crawfordsville, Kalona, Riverside, Washington, Wellman, and West Chester. Check http://co.washington.ia.us/. Mike Tully is the President and CEO of Aerial Services, Inc. (ASI) located in Cedar Falls, IA. ASI is a full service geospatial provider for over 35 years that provides aerial, oblique, and ortho photography, mapping and GIS services for government and industry throughout the United States. Mr. Tully is a Certified Photogrammetrist and has been working with GIS for over 15 years. Mr. Tully can be contacted via mtully@AerialServicesInc.com. How would you classify E-Docs? Is it a document-driven DSS? data-driven DSS? spatial DSS? Who is the targeted user for E-Docs? What is the major benefit of E-Docs? Why? What are the key IS/T challenges facing County governments in managing property data? Today? Five years hence? Do you see any strategic issues or potential problems for Washington County, Iowa resulting from its dependence on Aerial Services, Inc.? If so, how can the dependency be minimized? Tully, M., "E-Docs Asset GIS: Washington County, Iowa", March 6, 2006 at URL DSSResources.COM. Mike Tully provided permission to use this case study material at DSSResources.com on February 10, 2006. This edited version was posted at DSSResources.COM on Monday, March 6, 2006.